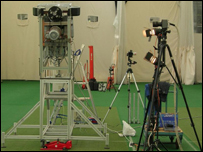 A machine that can replicate the spin and swing of bowlers has been developed at a UK university. The robotic bowler has been created at Loughborough University as part of a virtual reality project to improve match training for cricket. 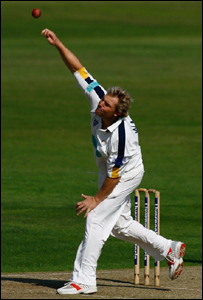 "Cricketers want to be able to face bowlers like Shane Warne," said project lead Dr Andy West. "The machine is helping us to figure out the science of bowling and the mysteries of spin and swing," he added. Dr West demonstrated the machine at a conference at Loughborough University organised by the Institute of Physics on Thursday. The spin and swing is put on the ball by a combination of two spinning wheels and a barrel which uses rifling theory to add side-spin. "That combination of rifling-style spin and the wheels applying top spin, back spin and side spin means you can apply any combination of spins that you want to," said research student Laura Justham. She added: "The rifling is based on rifle theory - using grooves in the barrel of a gun - which applies corkscrew spin or side-spin as cricketers call it. "It creates the off-break or leg-break delivery." The machine can also produce swing and reverse swing, mimicking fast bowlers like Glenn McGrath. "The machine can even replicate Shane Warne's famous 'ball of the century'," said Dr West. In 1993 Shane Warne's delivery to England batsman Mike Gatting left him bamboozled when the delivery seemed to be heading a foot wide of the leg stump, suddenly turned and clipped Gatting's off-stump. It is one of the most famous deliveries in the history of cricket. Dr West said the machine was designed to incorporate all the things that real players use such as the orientation of the seam on the ball and the speed at which it is released. The trajectory of the ball to the batsman is dependent on how the air next to the ball - the boundary air - moves around it and how it separates or moves away from it. There are two different types of air flow - laminar, which is smooth, and turbulent, which is rough. The seam on a cricket ball "trips" the air flow into turbulence, causing rough air flow on one side and smooth on the other. This uneven air flow creates sideways drift and the result, combined with the angle of the seam when it is released, the speed of the ball and the air conditions, is swing and reverse swing. "There is still so much more we can do with the machine," said Dr West, who has been working on the project for two years. The plan is now to utilise the machine as part of a virtual reality training system. The researchers aim to incorporate a visual element so that batsmen can see a projection of bowlers ahead of the machine firing out a ball. 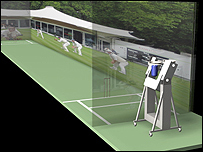 "Current bowling machines don't have any spatial or temporal information," said Ms Justham. "You get a person putting a ball in the machine and that's it. They are fantastic for training batsmen but they are not very good for match preparation. "This machine will have a visual element which will provide those cues so the batsmen can train effectively."